1. Peel off the skin of plantain on corners only. 2. Slice the plantain into thin pieces. 3. 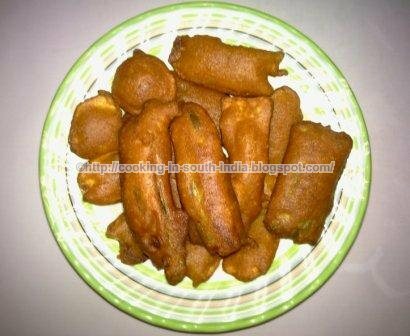 In a bowl add Besan, Rice flour, Red chilli powder, Baking soda, Salt and Asafetida. 4. Add water slowly and mix well until there are no lumps. 7. Deep fry on both sides until become golden brown. 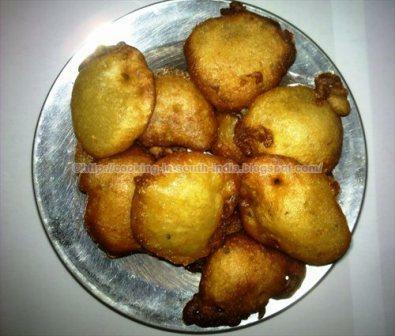 Kachayam is a popular and traditional Tamil Nadu sweet which is having the delicious taste. Kachayam is also famous in other South Indian States. While cooking you may feel the aroma of Cardamom and Banana mix. Time less and easy cooking. In a bowl peel the Bananas and mash them well. 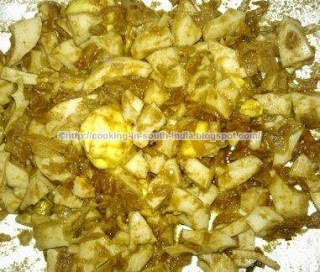 Add Maida, Rava, Cardamoms, Grated Coconut, Baking soda and Sugar with the mashed Banana. Add the water with the mixture little by little and make batter like idli/dosa consistency. Take a small amount of mixture using small and round shaped ladle. Drop the dough into hot Oil and deep fry until become golden brown on both sides. Now the kachayam is ready to serve. We can serve it Hot or even store this kachayam upto 2 weeks in a cool and dry place. 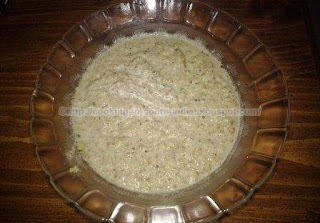 Note: I am using Coconut it is optional and Instead of sugar and Maida we can use Jaggery and wheat flour which is healthier than this and using this method is called Kodumai Kachayam. Try this recipe in your home and If you like, leave some comments which may encourage me more.